I just installed the latest version of the Intel Management Engine software from my motherboard manufacturer's website (version 11.6.0.1032). During installation, I got multiple alerts from my software firewall that it was connecting to the internet, which seemed unusual. I looked closer and it was something (rather fittingly) called Intel Online Connect. In fact, both an Intel Online Connect and an Intel Online Connect Access had been installed (in %programfiles%\Intel). By providing hardware-level data—in the form of a secure device code—during the 3-D Secure authentication process, issuers can have even greater confidence to approve low-risk transactions, or to require additional verification for suspicious ones. Called Intel® Online Connect, the solution will be included in 7th Gen Intel® Core™ systems and will work with the existing 3-D Secure protocol and the upcoming 2.0 version, which EMVCo is expected to release this year. 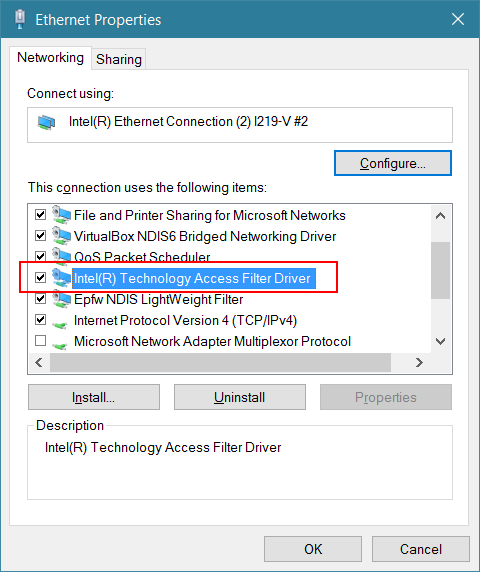 I carried on looking and I noticed that Intel Online Connect Access included a driver – more specifically an NDIS filter driver [archive]. Whilst I don't know what this driver is actually doing, I do know it's not going to be doing it much longer on this PC.